HOW TO VIDEO: National Interior Design Expert Cathy Hobbs of Design Recipes Shares Tips for “Different Antique Furniture Styles” As Part Of Her 13-Episode EHOW Video Series! 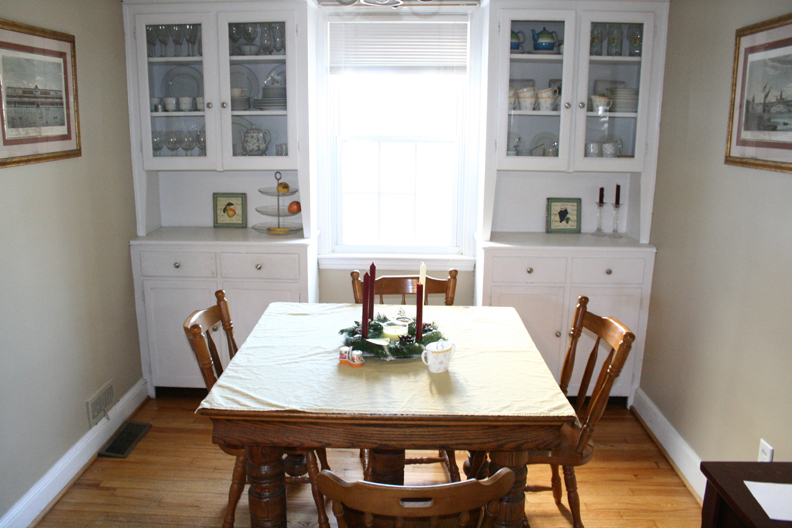 ≈ Comments Off on HOW TO VIDEO: National Interior Design Expert Cathy Hobbs of Design Recipes Shares Tips for “Different Antique Furniture Styles” As Part Of Her 13-Episode EHOW Video Series! Hi, everyone. I’m Interior Designer Cathy Hobbs, just like a great dress, it’s okay to mix and match when it comes to different furniture styles. I traveled to Karl Kemp Antiques in New York city where you can find nearly anything relating to antiques. What I’ve done for you is set aside three different distinct pieces from different styles and periods, in order to show you some of the differences. One piece is going to be from the Biedermeier period, another neo-classical, and a third from the American ’50s. This secretary is an absolute show stopper. This would be the highlight in any home. This is from the Biedermeier period, that famous Biedermeier period, Austrian from the 1820’s. So what makes this piece so special? Where do I begin? Inlay upon inlay upon inlay. Just look at all this wood detail. This light burl wood that you see mixed with dark mahogany wood. These are some of the distinctive features of the biedermeier period. Also, all of this architectural Roman detail. These columns that you see throughout the piece, actually gilded in gold. When it comes to antiques Biedermeier is probably one of the most easily recognizable and significant antique styles. So now we have grabbed our passport and we have moved from Austria to Russia. This is a beautiful example of a neo-classical chest. Look at all of this Greek key detail. This mid-century piece, this two drawer chest. But what makes this piece really distinctive and special is all of this ebonized wood inlay that you see. Both on the front, on all of the drawers, and on the side. As well as the bronze inlay that you see on the legs. So now we have left Austria, left Russia, and we have come to America with this beautiful bleached mahogany chest from the 1950s. We’ve seen all of the ornate detail that was distinctive of the Biedermeier period, distinctive of the neo-classical period, and we can now see the contrast with this American 1950’s piece. Just the simplicity of it. With the bronze ring pulls, the very clean lines of the bleached mahogany. So you can really get a sense by looking at all of these different pieces from these 3 different periods, the Biedermeier, the neo-classical, as well as the American 1950s, how different styles evolved. HGTV Design Star Season 6 Finalist, 5-time Emmy award winning television personality and National Interior Design Expert Cathy Hobbs (ASID/LEED AP) is the founder of the interior design firm Cathy Hobbs Design Recipes based in New York City. An ASID, NCIDQ Certified Interior Designer and LEED AP, Cathy’s firm specializes in full interior design services, sustainable design, new development construction and home staging/styling. With design studios in Brooklyn, New York and The Hudson Valley. Cathy Hobbs Design Recipes is currently working in the NYC Tri-State Area, including, Long Island and New Jersey, The Hudson Valley and The Berkshires. Cathy is known for her clean, modern, timeless interiors that infuse pattern, color and texture as well as her “Hollywood Glamour” approach to design. From small studio apartments to gracious homes, Cathy’s approach is to blend her professional expertise flawlessly with a homeowner’s wish list and aesthetic to create an impeccable design. Cathy has recently introduced two new interior design services: approachable, step by step interior design resource guides in the form of “recipes”, hundreds of Design Recipes™ are available through Cathy’s site http://www.design-recipes.com. 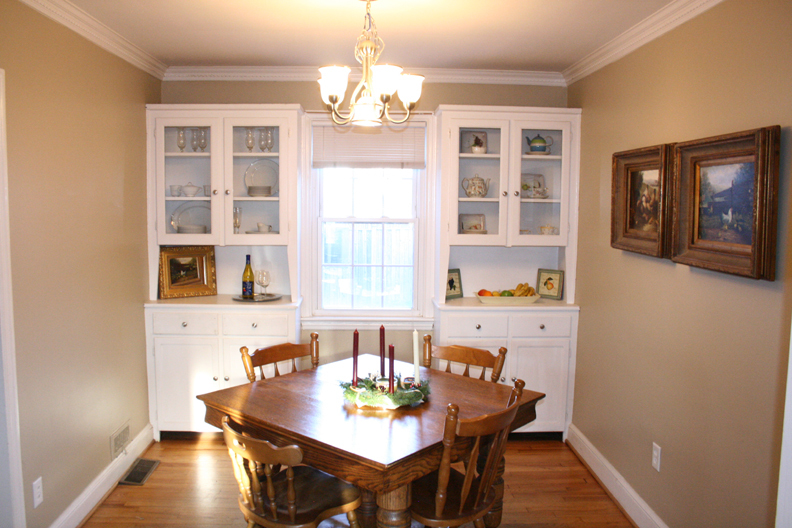 Additionally, Cathy offers the affordable, consultation interior design service Design On Delivery™ (www.designondelivery.com), offering unparalleled design services to DIY design enthusiasts at a reasonable cost. Cathy’s design philosophy is based on “approachable” design, working with various budgets in order to achieve the best design possible for her clients. A regular contributor and expert for local and national media outlets, Cathy has been featured on programs like “The Nate Berkus Show”, “HGTV’s Top Ten”, “LXTV’s Open House”, “The PIX Morning News”, “Living Large” on WCBS-TV”, “Martha Stewart Living-Radio” and is currently a regular contributor to the prominent shelter sites Sheknows.com, Ehow, Shoptopia and Cotton Candy Magazine. To learn more about Cathy and her work, go to www.cathyhobbs.com. ABOUT EHOW.COM: Since launching in 1999, eHow has become the “go-to authority” in online expert content. Ehow is an online how-to guide with more than 1 million articles and 170,000 videos offering step-by-step instructions. Ehow.com receives more than 46 million visitors to its site each month. HOW TO VIDEO: National Interior Design Expert Cathy Hobbs Answers the Popular Question: What Colors Can I Put With Yellow & Pink for a Girl’s Room? 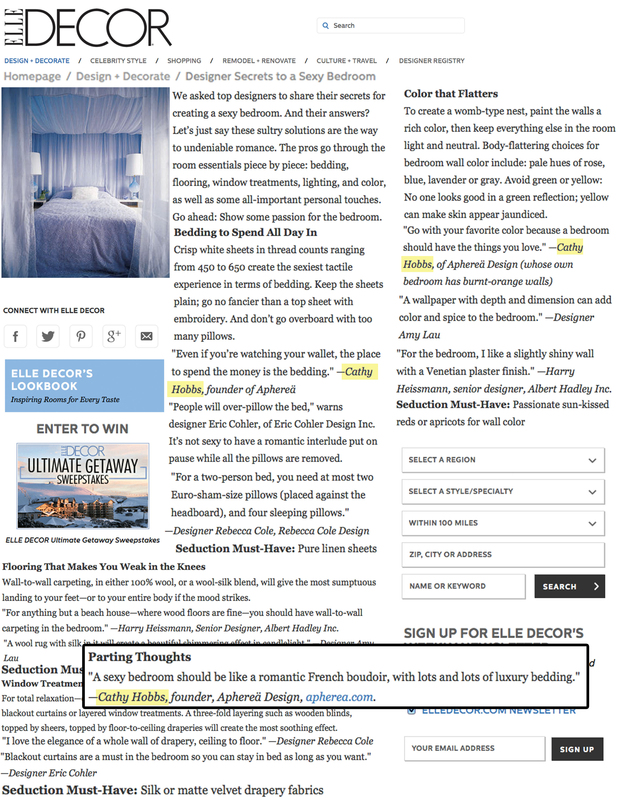 ≈ Comments Off on HOW TO VIDEO: National Interior Design Expert Cathy Hobbs Answers the Popular Question: What Colors Can I Put With Yellow & Pink for a Girl’s Room? When it comes to a girls room I think nearly anything goes. And pink is one of the more popular colors, especially the color combination of pink and yellow. So what are some colors that you can mix with pink and yellow in a girls room? At the top of my list, citrus colors, orange and lime green. Orange and lime are not only bright and friendly colors but they also add a touch of the unexpected. Mixing pink and yellow with citrus orange and lime green, not only creates a colorful environment but it also adds an element of timeless design that will also grow with your child. In this really blended green and orange with yellow and pink in several different ways, beginning with a soft green colored wall with fun removable wall stickers that create this lovely enchanted forest on the wall. What little girl wouldn’t love that? We tie the green in further through the selection of this green play table and then brought in yellow and orange accents such as these super fun book ends. We also carry through our colors into the bedding with these adorable pink elephants. And on top this candy colored, polka-dot duvet that brings in more yellow and pink. But the real star of the show here is this pale pink rocking chair. Not only is this one of the most used pieces in this girls room but it also anchors the space, serving as a foundation in color. You’re going to want to make sure that in creating your pink and yellow room, that your primary pieces are in the pink and yellow and then add in some of your accent colors like the orange and lime later. Another color that looks really great with pink and yellow is blue. No, blue isn’t just for boys rooms. What we did in this particular room is introduced touches of blue through this indigo colored changing table. And this artwork, which ties in other colors in the room, such as yellow and green. I hope you found my tips for what colors you can mix with yellow and pink in a girls room, helpful. Art deco may have began in the 1920s, but it’s still one of the most recognizable and popular styles today. What’s wonderful about art deco is that you can pair some of the same pieces from the same art deco period together without overdoing it or you can mix art deco pieces from different styles and still have a cohesive look. 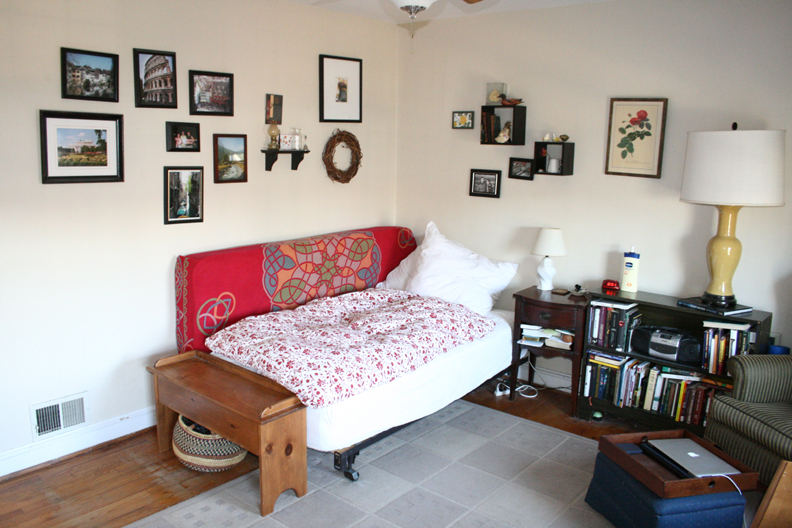 What I think they did in this cozy bedroom is blend different art deco pieces together with other styles flawlessly. 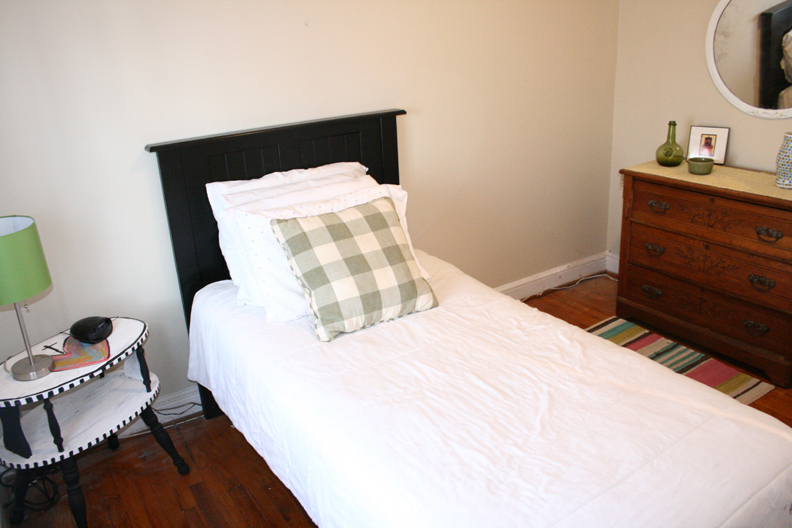 First, the owner has chosen beautiful wood inlay night stand, to flake a more modern canopy bed. Wood inlay is very indicative of the art deco period. Across the room sits a mirror on your side table from Z Gallery, which is a style very distinctive of the art deco period. Here, they paired it with a mirror that has more rococo. Beyond furniture, some other ways to bring art deco into your decor, through the use of accessories like these vases from Home Goods, always a treasure trove, fabulous finds. Elements like these ripples and sweeping curves are very distinctive of the period and as well as texture. Texture is use throughout this room from this sheep skin rug to this rich faux fur Z Gallery throw. Another really special art deco element in this room and a real show stopper is this cut velvet rocking chair. Some details that stand out in safe art deco include the quilted detail on the chair back and seat as well as the arched chrome legs. This piece was actually purchased at a vintage consignment store, a great resource for affordable art deco pieces. Other art deco interior design ideas include using materials such as aluminum, stainless steel, locker and even skins like shark skin or zebra skin. 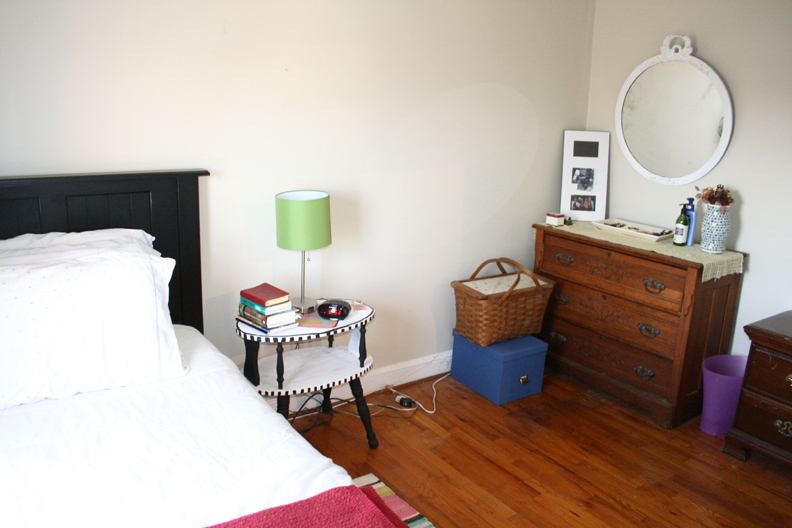 HOW TO VIDEO: Semi-Gloss vs. High-Gloss Paint For Interior Doors? Celebrity Interior Designer Cathy Hobbs of Design Recipes With Tips! ≈ Comments Off on HOW TO VIDEO: Semi-Gloss vs. High-Gloss Paint For Interior Doors? Celebrity Interior Designer Cathy Hobbs of Design Recipes With Tips! When it comes to painting interior doors, there’s often the dilemma of whether or not to use semi-gloss or high gloss enamel paint. The bottom line is that both will give you the same durability and resistance to stain and those sticky fingers. But, the major difference is how the two finishes will look. In order to demonstrate the difference to you, I finished two different pieces of plywood, one with the semi-gloss finish, the other with the high gloss finish. 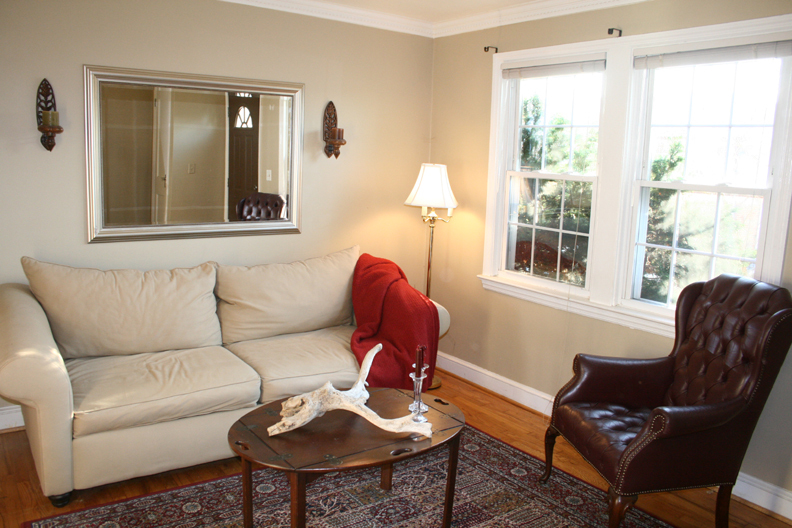 Both selections are actually the same color of paint from eco-friendly paint company, Mythic Paint. As you can see visually, it’s quite hard to detect the difference. The high gloss finish simply has significantly more sheen. In the end, the finish choice may simply come down to your own personal taste as both finishes achieve the same goal, which is to have your door stand out from the flat or egg shell finish that is typically used on walls. I hope you found my tips relating whether or not to choose semi-gloss or high gloss enamel paint when painting interior doors to be helpful! 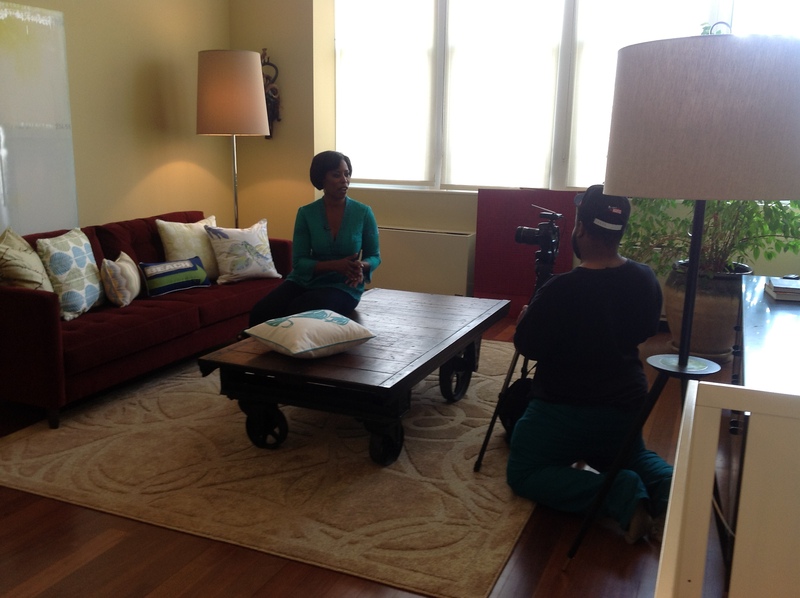 National Interior Design Expert Cathy Hobbs of Design Recipes Hosts 13-Episode Web Series on Ehow.com! 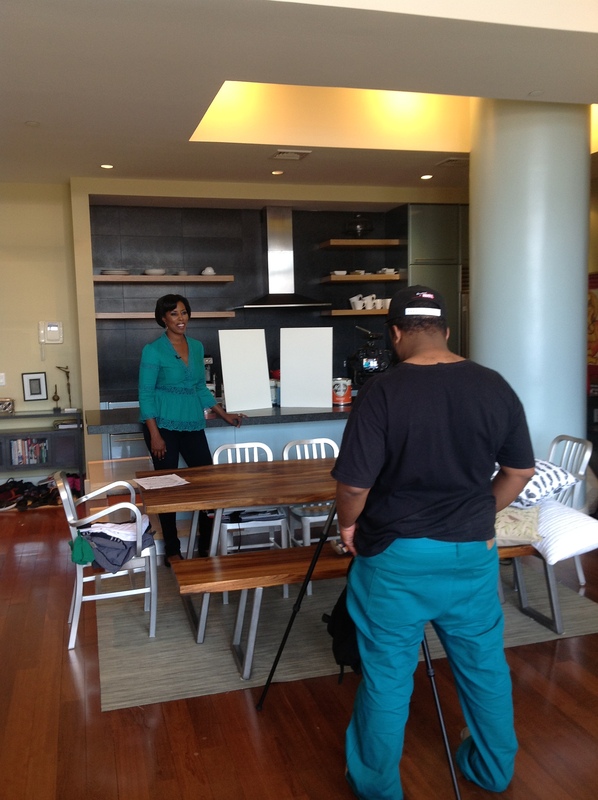 ≈ Comments Off on National Interior Design Expert Cathy Hobbs of Design Recipes Hosts 13-Episode Web Series on Ehow.com! 5-time Emmy award winning television personality Cathy Hobbs, founder and creator of Cathy Hobbs Design Recipes™ joins the ranks of Rachel Ray and other national personalities in landing her own web series on Ehow.com. Hobbs was selected to host a 13-episode web series, in which Hobbs’ expertise on design ranging from antiques to art déco décor was used to create a national expert web series. The web series which went live today, features a myriad of tips on topics such as “Art Deco Interior Design Ideas”, “What Is Welting On Pillows”, and “Home Décor With American Antiques” just to name a few. The informative home design web series, also partners the Cathy Hobbs Design Recipes brand with national brands such as Z Gallerie, Home Goods, Mythic Paint, and Karl Kemp Antiques. As a newly named, Ehow Presenter, the Cathy Hobbs 13-Episode Web Series will be the first of several web series, Hobbs will be hosting for the popular expert site. As real estate markets claw their way out of the protracted downturn, homeowners are looking for ways to get their properties to sell quickly without slashing the price, and many are turning to staging techniques. Most homeowners think they have the best decorating and ideal layouts, but experts say staging a home to appeal to a broad spectrum of tastes is important to attract more interested buyers. Staging a home involves decluttering, getting rid of personal decorations like pictures and wall art, and neutralizing the décor. 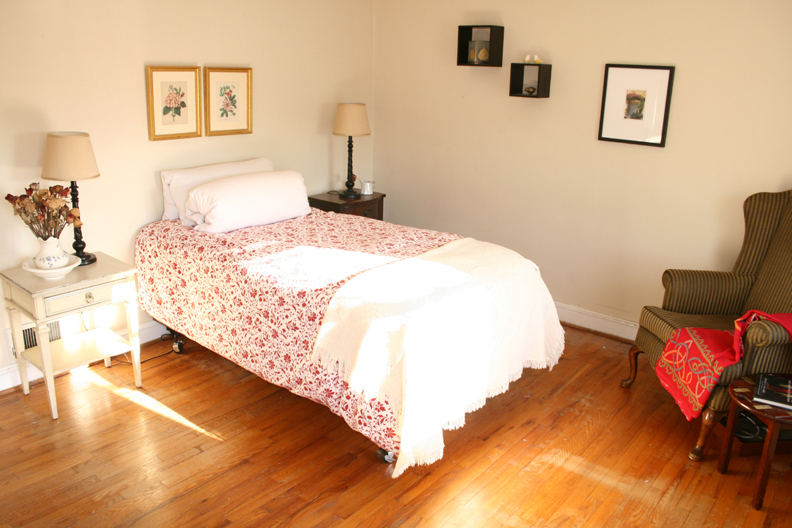 While Hobbs says professional stagers can charge anywhere from $75 to $250 an hour, there are steps every homeowner can take on their own, they just have to keep in mind three main rules: neutralize, depersonalize and declutter. Homesellers should swap out any bold colors for more calming choices like gray and taupe and eliminate any colorful or busy wallpaper or borders. Replacing old and bright area rugs with clean, more toned down ones can make a space feel more fresh and open. Sellers should also neutralize the outside of their house: Potential buyers will make a snap judgment about a property before even stepping out on the curb from their car. If a house lacks curb appeal, they might not even check out the inside. Hobbs suggests changing color-specific front doors to a more neutral color, and replace red mulch with black mulch and change outdoor fixtures to ones with a black or dark finish. A house swarming of personal items like trophies, vacation and baby pictures, and spoon collections can easily scare off potential buyers. “When someone comes into the home they need to feel this can be their home,” says Hobbs. “All of those personal items are very distracting to a potential buyer.” When showing a home the ultimate goal should be getting buyers to notice the space–not wedding pictures. A potential buyer doesn’t want to walk into a home and see it crammed with furniture, work materials and everyday clutter. They want to see large rooms with just the right amount of furniture and decorations so they can picture their belongings in the space. 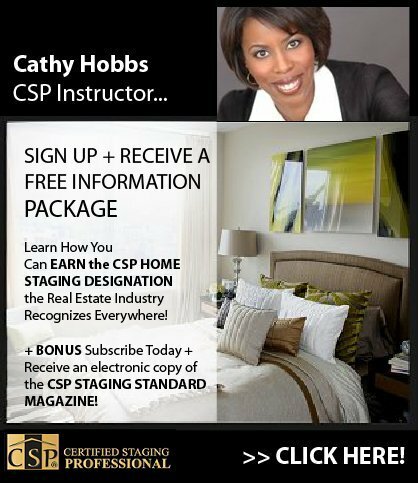 WASHINGTON, D.C. AREA HOME STAGING COURSE TAUGHT BY CELEBRITY HOME STAGER CATHY HOBBS OF HGTV DESIGN STAR RETURNS TO D.C. AREA AFTER MUCH SUCCESS, MARCH 27-29 2012! ≈ Comments Off on WASHINGTON, D.C. AREA HOME STAGING COURSE TAUGHT BY CELEBRITY HOME STAGER CATHY HOBBS OF HGTV DESIGN STAR RETURNS TO D.C. AREA AFTER MUCH SUCCESS, MARCH 27-29 2012! After an incredibly successful 3-day Certified Staging Professionals course in November. Celebrity Interior Designer and HGTV Design Star Finalist Cathy Hobbs will be returning to Arlington, Virginia, March 27-29, 2012. 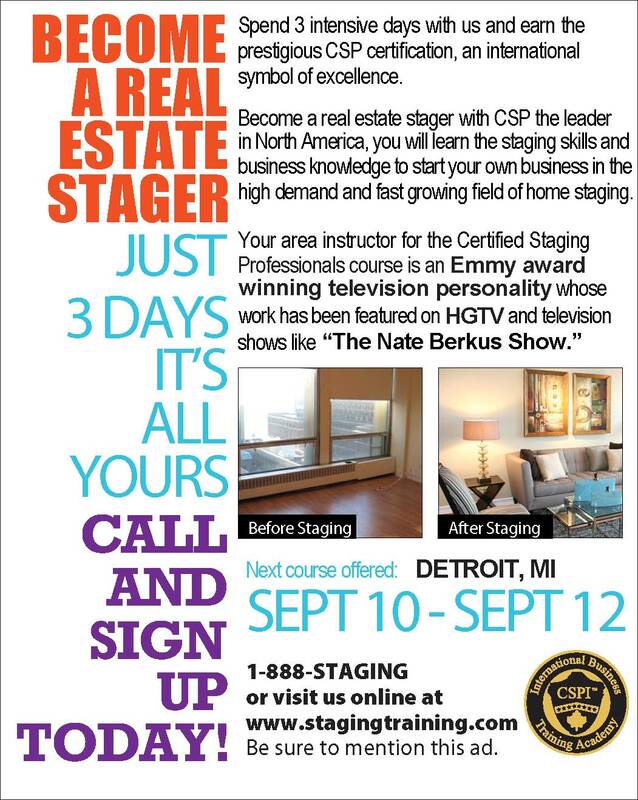 The course also covered in Washington Home and Garden Magazine offers aspiring home stagers, 3 days of intensive training that leads to the prestigious Certified Staging Professionals designation. 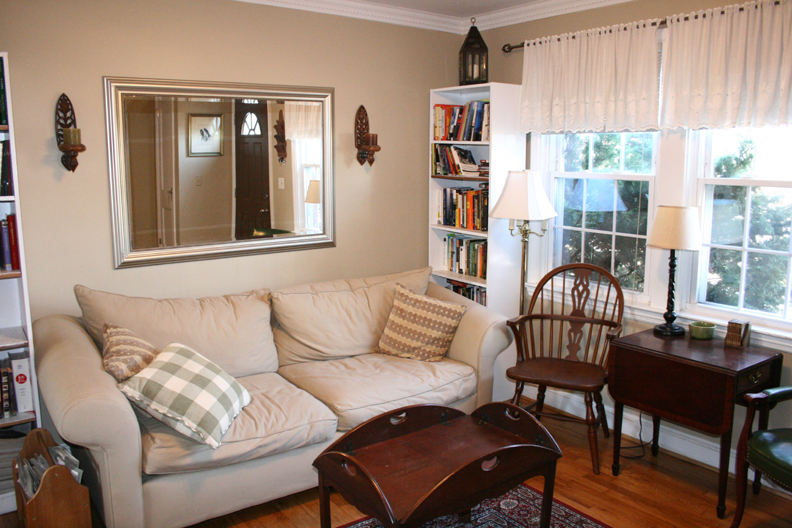 Remember when black and mauve was the hot color combination and when mirrors were all the rage? Well, in case you are too young to remember, those were some of the staples of 80s home décor. The 80s were indeed the decade of opulence, marble, gold, and mirrors; however these days, the trend is toward minimalism and more subtle design. Even so, it may not be unusual for a potential buyer to travel back in time when faced with an apartment that has not been renovated since its 80s glory. As an interior designer who often works on renovations, and a home stager used to working with furniture and accessories limited to a home sellers own possessions, my biggest tip is to embrace the past! I was recently asked by the extraordinarily talented real estate agent Angela Rapoport of The Corcoran Group to stage her Penthouse listing located at 255 East 49th Street on Manhattan’s East Side. As someone old enough to remember, I immediately identified the fact that I had walked back into the 1980s, cue the DeLorean car and Patrick Nagel painting, anyone? While it would have been easy to suggest covering up as much of the 80s-themed design as possible, I chose to embrace it, as this property is truly spectacular and to me and it never makes sense to cover up great design, no matter when it was done. The reality is the same challenges I faced as an interior designer and home stager are similar to those that any home owner or home seller will face when looking to modernize an interior space designed decades earlier. 1. First, embrace the current décor and use it as inspiration. In the case of the Penthouse at 255 East 49th Street, all of the floors were either black or white marble, or a combination of the two. My solution was to build a color palette around the two colors, infusing bursts of bright color while using black and white as the foundation for my color scheme. 2. Soften a space, while adding color and texture. Whether floors are made of marble or hardwood, it is often an appealing solution to add softness through the use of area rugs and soft goods such as toss pillows. 3. Add elements such as greenery. Nothing quite softens a space like the use of plants and greenery. When I am often faced with interiors that have a lot of architectural or natural elements, I try to keep my décor as simple as possible. One example of this in the case of the Penthouse at 255 East 49th Street was to select a centerpiece that was a simple orchid, as opposed to something too elaborate. 4. 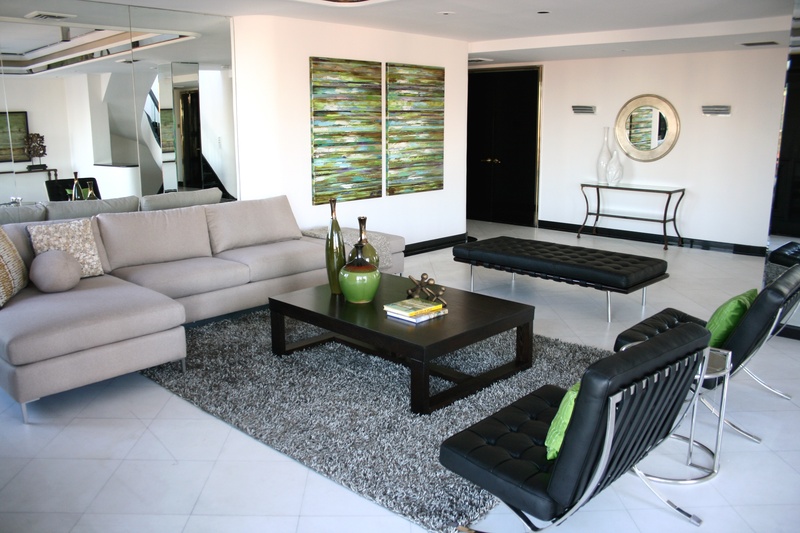 Select a mix of modern and contemporary furnishings. The wonderful aspect about design is that you don’t have to follow any formulas! For instance in the case of the 80s penthouse, I mixed modern, timeless pieces with those that were more antique, in order to embrace the existing architectural details. It is important to not ignore the current design and décor but instead to embrace it as another design element. 5. Finally, focus on function and lifestyle, when it comes to lifestyle, we are always evolving, a room that may have been popular in another decade, may now be considered to be a waste of space. These days, with space at such a premium, it is even more important than ever that all areas of a residence are shown as useful and with a purpose. ARLINGTON VIRGINIA HOME STAGING COURSE TAUGHT BY CELEBRITY HOME STAGER CATHY HOBBS OF HGTV DESIGN STAR RETURNS TO WASHINGTON, D.C. AREA AFTER MUCH SUCCESS, MARCH 27-29 2012! ≈ Comments Off on ARLINGTON VIRGINIA HOME STAGING COURSE TAUGHT BY CELEBRITY HOME STAGER CATHY HOBBS OF HGTV DESIGN STAR RETURNS TO WASHINGTON, D.C. AREA AFTER MUCH SUCCESS, MARCH 27-29 2012!